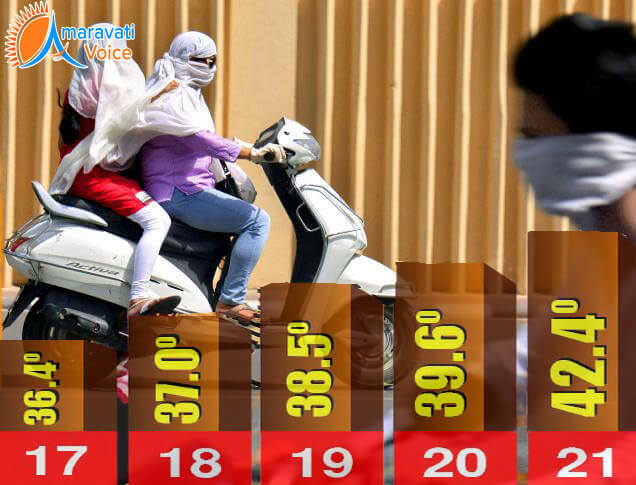 Temperatures that have been on the rise for the past one week hit new heights in Andhra Pradesh on Monday. On Monday, the highest day temperature of 43 degree Celsius was recorded in Nandigama, followed by Vijayawada at 42 Celsius. Heat wave like conditions prevailed across the sate since 11 AM yesterday. Meteorological Department Officials are saying that, similar hot conditions are likely to prevail for at least another two or three days. People have been advised to take necessary health precautions to overcome the heat related problems.